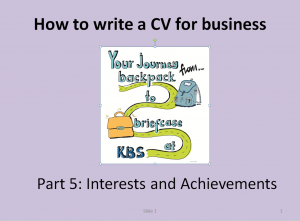 The purpose of your CV is to underpin your cover letter or application. 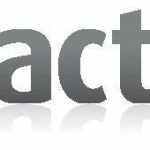 It provides an informative and concise list of your achievements in relation to what you are applying for. Below are 6 short videos (approx. 3 min. ), each explaining a structural section of the CV. Part 5 – Baking Society example. Please read Freshers’ Fair. A standard CV designed to fit all roles can only be general and therefore is unlikely to make any significant impact. 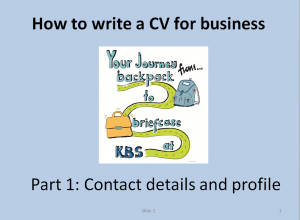 You will not need to create a new CV for each job (but you will need to write a new cover letter for each application). 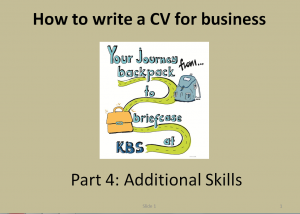 However, it is important to produce a CV that is targeted for your chosen career area. 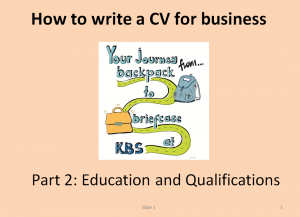 For example, if you want to increase your employment chances and apply to jobs in different fields, say, marketing and in finance, then you could produce two CVs, a Marketing CV and a Finance CV. Each one will be have a separate emphasis. 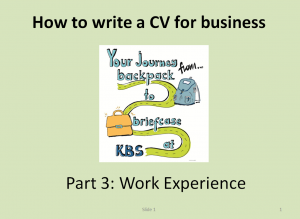 The marketing CV, for example, would include any marketing and related modules studied in your education section, any initiative you’ve shown to promote something during your work experience or interests and activities and emphasises your communication, team working, creativity and social media skills. By contrast, a finance CV would highlight modules with a finance/economics content, analytical, numeric, problem-solving and communication, team working and leadership skills from societies (something banks value especially). FONT: Ariel, Tahoma, Verdana (avoid Calibri – too much line spacing), black, size pt. 10-12. Avoid italics and bold with underline (can give a cluttered look). 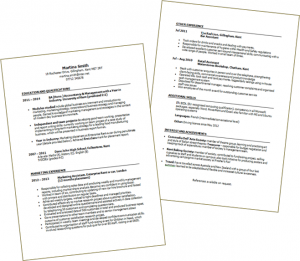 LENGTH: The standard CV in the UK is 2 full A4 pages (avoid 1 and a bit). Tips: if you go over, reduce margins and font size (min. Ariel pt 10 or equivalent) and if you have a little over 1½ page, include references and increase margins and font size to achieve 2 full pages (max. Ariel pt 12 or equivalent). 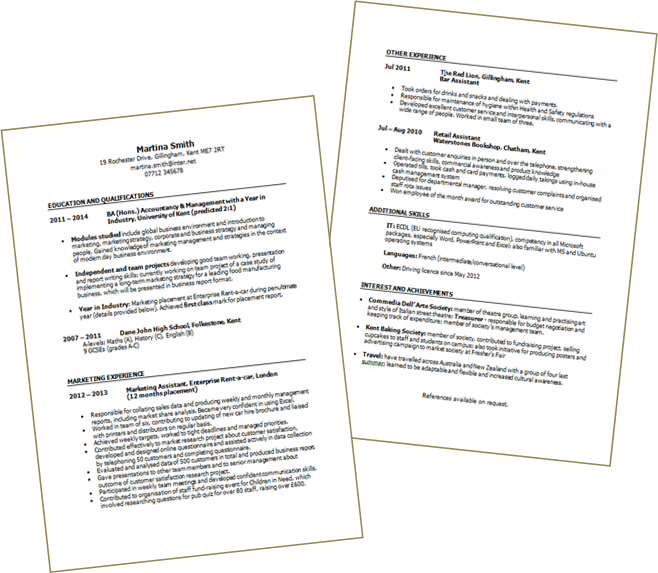 One-page CVs are often used for applications to investment banks and US-based management consultancies. DATES: Be consistent with dates. Either all on the right or all on the left.Exact dates are not needed and year-year is fine for education. Do include the month in the work experience section. SPACING: Make most of your horizontal space – avoid large margins, lists or tables for grades. Avoid frames around the whole document. STRUCTURE: Contact details, Education, Experience, Additional Skills (hard skills only; soft skills incorporated where you applied them), Interests & Achievements. OTHER COUNTRIES: Different CV formats apply for different countries. 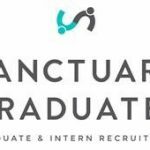 Check at Going Global (www.goinglobal.com) or Target Jobs (https://targetjobs.co.uk/careers-advice/working-abroad). PAST TENSE: For work experience in the past, use the past tense. The above image is a CV example for final year with year in industry. Tip: Aim to get feedback from a careers professional, either at KBS or Careers and Employability Service (click here for an appointment). 11 crucial questions answered to help you make your CV stand out. Click on image to read. 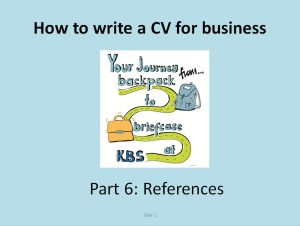 The examples provided on this blog are using a chronological CV format, which is what most employers would expect from a top 20 university. More information about other examples can be found on the Careers and Employability Service’s website, www.kent.ac.uk/ces, and at Graduate Prospects, www.prospects.ac.uk/cvs.htm.